After many experiences as IT project manager, David Autissier became Professor at the University of Paris XII in 1998. He received a PhD in Management from Panthéon-Sorbonne University. Expert in Change Management, he worked for many major companies helping them to build their change strategy. 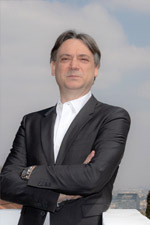 David Autissier is teaching management and change management at University and in several renowned business schools such as IAE Gustave Eiffel University Paris Est, University Paris Dauphine, ESSEC, ESCP, and ENA. His academic work concentrates on fostering the capabilities that influence a company’s ability to change. His publications have appeared in various specialized journals. He is the author or co-author of 54 books. Autissier D., Li P., Moutot JM., (2017), Delivery. Book in Korean, edited by Korean Edition. Pachtchenko - de Préville E., Raynard T., Autissier D. (2017). Learning networks as a form of learning organization and an effective method for implementing organizational change. In. : Ivanova N., Benton S., Shtroo V., Antonova N. (Eds). Business Psychology: An International Perspective. Moscow: University book, pp. 343-360 (in Russian). Autissier D., Johnson K., Moutot J-M. (2016), Workshop - Strategy & Management, JFD Editions Canada. Autissier D., Moutot J-M., Peretti J-M, Wu S, Temsamani B. (2016), Changement et Transformation, Voyage dans les cultures occidentales, chinoises et arabes, Ouvrage écrit en arabe Littéraire, Editeur : Econumerik Maroc, Collection ESSEC. Autissier D., Pachtchenko-de Préville E., Raynard T., (2016), Learning networks as an effective mean to improve the commitment of employees in activity of organizations and companies (in Russian). In “Participation by employees in management of work as a means of ensuring the social peace and the efficacy of organization” / The collection of materials International scientific-practical conference, Institute of Socio-Economics and Law of The Academy of Labor and Social Relations, December 16, 2015, p. 172-177. Autissier D., Pachtchenko-de Préville E., Foucrit JC., Raynard T., (2016), "Managerial innovation through the example of the use of learning networks in The French National Railway Company", "Organizacionnaâ psihologiâ (Organizational Psychology) 2016. Vol. 6. No. 1. P. 20–38, Russian Review. Autissier D., Bareil C., Giraud L., Johnson K., (2016), "Excessive change and coping in the working population", Journal of Managerial Psychology, Vol. 31 Iss: 3, pp.739 - 755. Autissier D. de Préville E., (2015), Феномен организационной вовлеченности : сущность, виды, институциональные предпосылки / The phenomenon of organizational commitment: the essence, types, institutional preconditions, Institutional Economics Conference, 17&18 november 2015, State University of Management, Moscow, Russia. Autissier D., Moutot J-M. (2015), Go Workshop, Book in Korean, edited by Korean Edition. Autissier D., Ben Lahouel B., Montargot N., Peretti J-M., (2015), "Modeling, assessing and benchmarking eco-efficiency of French firms: a non-parametric approach", EAM 2015 conference in Philadelphia USA, May 2015. Autissier D., Meslin T. (2015), How to be successful in major change projects, 20 good practices to change the business, Book in english, edited by Eyrolles. Autissier D., Moutot J-M., Peretti J-M, Wu S. (2014), Change & Transformation, 转变与改变, Book written in Mandarin and French as part of a collection of books Franco-Chinese, 中法管理学丛书 总序 , ISBN 078-7-5162-0524-2, Edited in China. Autissier D., Ben Lahouel B., Peretti JM., (2014), Stakeholder Power and corporate social performance : The Ownership Effect, Corporate Governance, Vol. 14, issue 5, October 2014. Autissier D., Ben Lahouel B., Peretti JM., (2013), Data Envelopment Analysis for Measuring Corporate social performance : An industry level study, 15 ème Université de Printemps IAS Zadar. Autissier D., Giraud L., Moutot JM., (2013), Monitoring employees’ attitudes and behaviors towards change: a longitudinal study along the change implementation stages, XI International Scientific Conference called «Management and Engineering’13», organized via the UNESCO Chair «Entrepreneurship, Innovation and Change Management», 23 to 26 June Sofia Bulgaria. Autissier D., Ben Lahouel B., Peretti JM., (2013), Can we evaluate change project efficiency within the context of environmental agenda, 50th Annual Meeting of the Eastern Academy of Management, May 8 to 11, 2013, Maryland USA. Autissier D., Giraud L., (2013), Uncovering the intellectual development of the Journal of Organizational Change Management: a knowledge-stock and bibliometric study, 1995-2011, Journal of Organizational Change Management, 02/2013, Volume 26, Issue 2, April 2013.